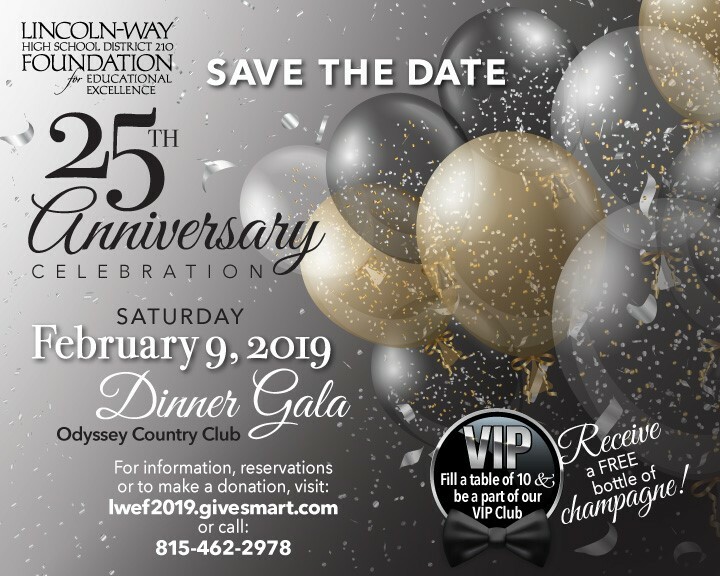 The Lincoln-Way Foundation invites all Chamber members to celebrate their love of Lincoln-Way at this year's 25th Anniversary Dinner Gala & Auctions to be held on February 9, 2019, 6pm, at the Odyssey Country Club, Tinley Park. This fun night out includes a delicious dinner, refreshments, DJ, plus live and silent auctions of some amazing 90 plus gift baskets donated by businesses whose generosity makes a positive difference in the lives of many Lincoln-Way students and families. This event is the largest fundraiser of the year for the Foundation, which was started in 1994. The Foundation’s mission is to generate funds in order to enrich and enhance opportunities and educational experiences of Lincoln-Way High School District 210 students. Make your reservations today! Individual reservations are $125, reservations for two $250, or fill a table of 10 and be a part of the VIP Club and receive a free bottle of champagne! When making reservations, enter the promo code word CALENDAR and receive $25 off on two reservations. For information, reservations, or to make a donation, visit lwef2019.givesmart.com or call Bob Kennedy at 815-462-2976. Those unable to attend can still bid on silent auction and raffle items by registering at lwef2019.givesmart.com. Thank you for your ongoing support of our 501(c)(3) non-profit organization. Purchase tickets or make a donation at lwef2019.givesmart.com.